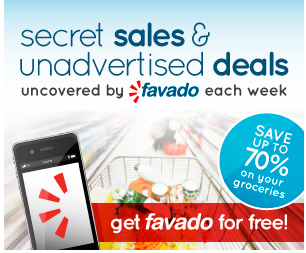 The Best FREE Grocery List App is here…introducing Favado!! The Favado Grocery List Mobile app will help you know where the best deals are at the stores you normally shop at. This app has Nationwide store chains, both regional and national. First Check out the video below and then make sure to sign up right away to be one of the first to use the app! Then share our post link with all your friends via Facebook and Twitter and tell them how easy it will be to save!! 2) you will receive an email verifying your email address. 3) Once you receive your verification email, go to the app store on iphone or andriod market and download the app! 4) This is just kicking off tonight so there may be a delay in downloading on Itunes or Android so make sure to submit our email address here so you dont miss any updates about downloading! 5) You are now on your way to saving 50-70% on groceries from your MOBILE PHONE!! In order to print coupons that are available, you must email the shopping list from Favado to yourself. It only takes a second and then you can email the list and print the coupons right from your email!! Please let us know what you think of the new Favado Grocery List Technology! !